Thanks for the photo Mark. That is a real bruiser. 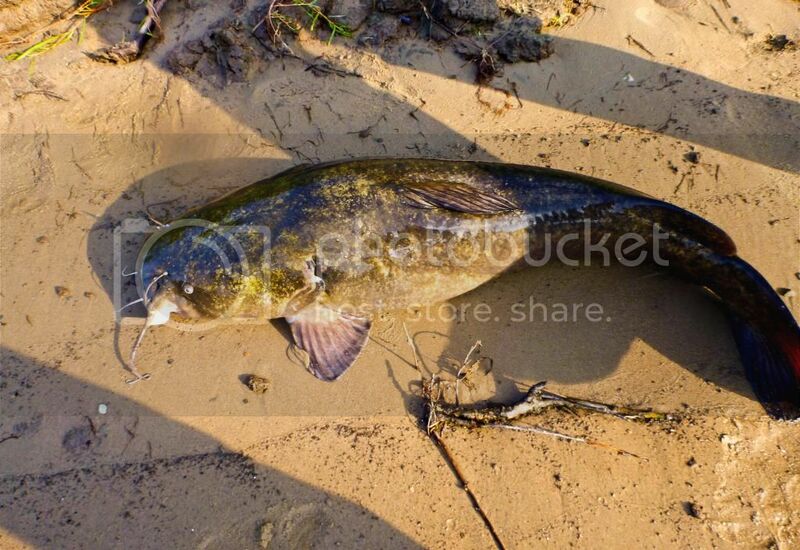 I've never eaten flathead, but it's supposed to be the best eating catfish and that's saying something: nothing wrong with channels; I've eaten a few blues and they were very good; for a flathead to be better than that, it's got to be excellent. Let us know what you think after you've had some of it. Talking with Brian K he says live bait is preferred pre-spawn but as winter approaches they eat live/dead 50/50. Brian K recommends an 8" sucker step on it and cut in half. Sounds like now is the best time to target. Water is 60-65 but as it drops to 50 the bite slows down and temp at 40 they shut down and go into hibernation mode. Now is the time apparently! Will be sure to let people know the taste. Gonna eat some soon. Went on a guided trip for flatheads a few years ago on the Rock River in Prophetstown, IL with the famous Cat Matt. He uses his down imaging sonar to find rootballs near shore in 10-20 ft of water, anchors up, drops some 12" shad down into the structure and waits for a strike. I caught two nice ones with him in about 4 hrs, one 12 lb and a 22 lb. Fun fights! Thanks guys. My biggest freshwater fish to date. If I could catch these guys every day I think I would! One just has to have the patience because it is a waiting game in general. I took my son Matthew to the Cannon on a favorite spot Saturday evening and we caught nothing! I love the colors on these mud cats. Like golden flakes. Better than channel for sure. Similar light flaky white meat texture just "less fishy." Even cleaning the pan while I let the fish cool I could tell right away. A really mild beautiful tasting fish.